Establishment of business in the internet is becoming a trend in the present business methodology. Branding your products and services at the right time with the right strategy can cause a greater impact in the growth of your business. In business perspective, online branding of a product is similar to introducing a product before a customer for the first time. The prominent advantage of online branding is that your physical presence is not required for the marketing process. All you need to do is to provide all the necessary information about the product and services in the web page of the company or product. Online branding is entirely different from traditional branding. Why Magento is Mostly Used e-Commerce Application? Magento could be your best choice for your own online shop as it provides Magento Open Source E-commerce web application. Have you ever thought why Magento is mostly used rather than other PHP e-commerce application? There are so many other PHP e-commerce applications, and they are all different in features then how can Magento be the best? There are few answers to this question about Magento as it gained the high popularity within a short time period and it became famous among internet based merchants. 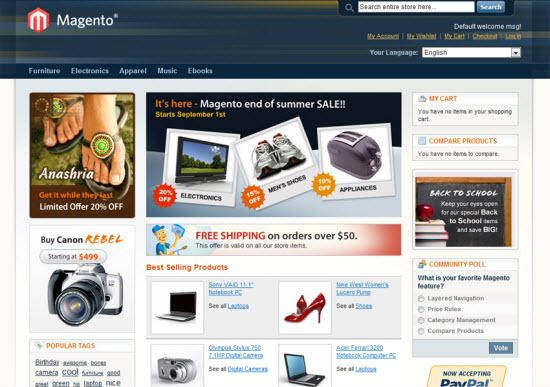 Read moreWhy Magento is Mostly Used e-Commerce Application? Once upon a time, web access through a TV was a slow and cumbersome process. Modern advancements make it easy to use your smart TV. Daily tasks are speedier when you aren’t near the computer. These days pretty much everyone is a videographer. No longer does capturing a great moment on video require you to think ahead and lug around a camcorder. Now you can whip out your point-and-shoot digital camera or smartphone to shoot HD-quality video, whether it’s a great scene from your vacation or your friend’s latest skateboard trick. The world tablet market is fast growing by leaps and bounds. The demand for powerful and feature-rich tablets is on the rise all across the globe. All the leading mobile manufacturing companies are engaged in innovating and developing stylish, advanced and feature-rich Tablets. The Norwegian based developer Opera is already a big name in the world of web browser. With millions of users worldwide, Opera has become the preferred choice for web browser. Opera is giving a tough competition to the likes of Internet Explorer, Google Chrome, Mozilla Firefox and others too. And now Opera has released the trial version of its latest web browser in the form of Opera Next 15. Opera Next presents a sneak peek into the Opera’s latest web browser. Creating a stylish, feature-rich, user-friendly and attractive website is a cherished dream for almost every website promoter or blogger. After all, a richly designed, beautiful, and user-friendly website has all the potential to attract and retain visitors. You very well know that you need a powerful website in order to build and run a successful online business model. The much awaited Sony Xperia ZR has been finally announced. The new Smartphone comes with an amazing water resistant capability and is able to take photos and videos underwater. Sony has further declared that Xperia ZR would be available soon throughout the world, starting from Q2 2013, but has not yet disclosed its pricing.